As their name indicates, these restorations consist entirely of a single piece of alloy. Metals used in crowns and bridges include gold alloy, other noble alloys (for example palladium) or a base-metal alloy (for example nickel, chromium or titanium). Stainless steel or aluminium-prefabricated crowns are used as temporary crowns. Compared with other crown types, less tooth structure needs to be removed with metal crowns, and tooth wear to opposing teeth is kept to a minimum. Metal crowns and metal bridges withstand biting and chewing forces well, rarely chip or break and probably last the longest in terms of wear down. 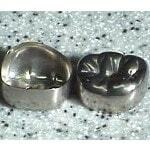 The main disadvantage of full metal restorations is their poor aesthetics, the metallic color being the main drawback. Metal crowns and bridges are a good choice for out-of-sight back teeth (molars, sometimes premolars). To prevent the detachment of acrylic or composite veneers on less visible molars, a full metal crown may be a better choice than a metal acrylic one. Although porcelain fused to metal seems to be a better solution, full gold or full titanium restorations are still widely used on posterior teeth. Gold is a superior dental alloy utilized for various types of indirect restorations : porcelain fused to gold crowns and bridges, full gold crowns and bridges, dental implant abutments, removable partial dentures or inlays. The gold alloy is composed of many different types of elements : noble metals : gold, platinum, palladium, silver, and base metals : copper, tin and others. A proper gold alloy should contain at least 60% noble metals. Gold alloy never corrodes. Some metal alloys, under the influence of saliva, may suffer in time a phenomenon called corrosion. This may lead to the appearance of an unsightly grey coloration in the upper part of the dental crown. Gold alloy has superior strength and resistance. The main advantage is that gold alloys can be manufactured at a very low thickness and still preserve strength and resistance. The benefit is that less tooth structure needs to be removed. Gold alloys are lighter than base metal alloys (with the exception of titanium). 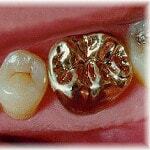 Gold alloys are very well tolerated by the body and do not produce any allergic reactions. Besides gold alloys, other types of noble metal alloys are available. For example, the palladium alloy contains palladium, gold, silver and other base metals. 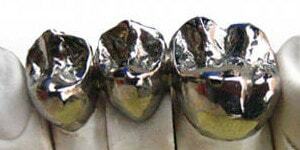 The use of titanium alloys for medical and dental applications has increased dramatically in recent years. Many of titanium's physical and mechanical properties make it desirable as a material for dental implants and prostheses. The strength and rigidity of titanium are comparable to those of other noble or high noble alloys used in dentistry. full titaniumIt is impossible to visually make the difference between a titanium restoration and a base metal restoration bridge. In dentistry, titanium is used for many purposes : dental implants (main purpose), base material for porcelain restorations, full metal restorations and others. 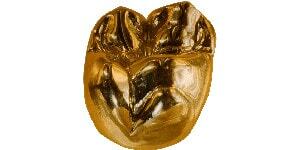 Although the cost of titanium restorations is high, it doesn't usually reach the price of gold reconstructions. 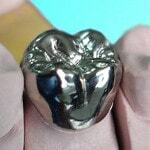 Full base metal restorations are the less expensive reconstructions. They have good strength and durability, although inferior to gold or titanium alloys. Various metals can be used : nickel, chromium, iron etc. 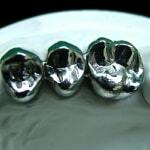 Stainless steel or aluminium are mainly used for temporary crowns. They are a good choice for out-of-sight molars when patients cannot afford more expensive prostheses.